As Brian Kelly gathers his battered troops for a trip to Los Angeles to conclude the regular season in Notre Dame’s 85th meeting with Southern Cal, rumors swirl around the fifth-year Irish head coach. Speculation centers on this question: Wouldn’t a job as an NFL head coach seem more appealing than dealing with endless recruiting wars, academic suspensions, an uneasy fan base, and yearly sky-high expectations? After all, in the NFL, when players drop from injuries, you simply hire some new ones. And you can lose six or sometimes seven games and still have a playoff team. Ah, but this grass-is-greener mirage is nothing new. In fact, 90 years ago, on Notre Dame’s first-ever trip to sunny Southern California, it nearly ensnared legendary Irish coach Knute Rockne. 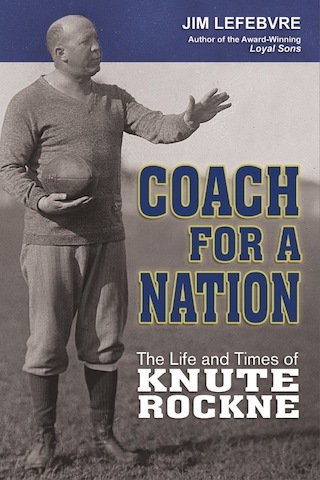 In the fall of 1924, Rockne and his Fighting Irish became a truly national phenomenon. From their victory over Army at the Polo Grounds in New York — after which sports writing giant Grantland Rice gave the “Four Horsemen” nickname for the Irish backfield — to the opening of the new Grant Park stadium in Chicago with a win over Northwestern, to huge victories over leading teams from the South (Georgia Tech) and the Midlands (Nebraska), Rockne’s “Wonder Team” had the nation buzzing. The ND-USC series garnered national excitement. Here in 1927 George Herman “Babe” Ruth (wearing ND), Knute Rockne, sports agent Christy Walsh, Lou Gehrig (wearing SC), and USC coach Howard Jones. After a 9-0 regular season, they embarked on a bowl trip for the ages – a three-week odyssey to and from southern California to play in the January 1, 1925 Rose Bowl. During that trip they were feted at each stop by Notre Dame alumni, Knights of Columbus, local fans, officials, and clergy. In the Rose Bowl game, before a packed house and a radio transmission that stretched coast to coast, the Irish used three defensive scores to upend mighty Stanford, coached by Pop Warner and featuring the great Ernie Nevers, 27-10, to cap a season which earned Notre Dame its first consensus national championship. On Friday, January 2, the Notre Dame traveling party enjoyed a tour of Hollywood and the motion picture studios. The Irish players, sore from the terrific battle, were able to smile through the festivities; all day, cameras clicked as the players met movie stars, who signed studio publicity photos for the players. The highlight was the meeting of the greatest of all stars – Rudolf Valentino – and the newly crowned king of college football – Rockne. Each resplendent in their finery, they chatted a bit and posed for a photo. Rockne’s easy manner made for pleasant exchange, though it was unlikely “The Sheik” had watched much football that or any other season. Still, the fact one of his motion pictures now had its name attached to Rockne’s star backfield made the few moments the two spent together a perfect finale to the 1924 season. That evening, Leo Ward and the Notre Dame Club of Los Angeles hosted a first-class dinner-dance at the Hotel Biltmore, providing the players with their first real chance to celebrate. No expense was spared, and the players enjoyed what one called “one of the outstanding events of the trip.” By 7:30 the next morning, they were aboard the Daylight Limited headed to their next stop, San Francisco. But Knute and Bonnie Rockne stayed behind in southern California, for several days of relaxation and personal business. Notre Dame alum Angus McDonald had paved the way for the Rocknes’ stay, writing Father Walsh in mid-December that Rockne would need a break after the long, grueling season “for the sake of his own and his wife’s health.” McDonald noted that the coach was in a “highly nervous condition…I fear that unless he takes a rest he will break down.” Few alumni could address Walsh as McDonald did, suggesting the president “should let Rockne know that his absence from the university will not seriously interfere with anything, and thereby relieve his mind.” Walsh offered no resistance, and the layover was planned. What neither Walsh nor McDonald had counted on was a meeting the Rocknes would take with officials at the University of Southern California. The school’s football team was coming off a season filled with embarrassments: a fifth consecutive loss to the University of California; broken athletic relations with both Cal and Stanford over allegations of Southern Cal using ineligible players; and, following the cancelation of the Stanford game, a loss to little St. Mary’s, coached by former Notre Dame star Slip Madigan. Over six seasons, “Gloomy Gus” Henderson had a 45-7 record, but twice perfect seasons were upset with losses to Cal, and officials were ready to make a change – especially if they could nab the hottest coach in football. Already, Bonnie Rockne had fallen in love with southern California. The sunny days, soft breezes, comfortable nights, open spaces and orange groves all spoke to a more relaxing existence than back in cold, snowy, sometimes stark South Bend. Here, kids could easily play outdoors year-round, with plenty of activities from which to choose. For Knute, now a celebrity himself, the idea of being around the movie stars and other notables had a certain appeal. And when they were taken on a tour of the recently constructed Coliseum, its columns and arches mimicking its Roman namesake, its huge field surrounded by nearly 76,000 bleacher seats, the Rocknes were all but sold. No more would Rockne have to dream of the far-off day when the authorities at Notre Dame and in South Bend could become perfectly aligned and the coffers full enough to erect a proper stadium. Here, he envisioned year-round use of the magnificent structure for not just football games, but track meets, athletic festivals, and coaching schools. Southern Cal was willing to meet a number of conditions – and make Rockne a relatively wealthy man. This was vastly different from some of the other schools who had approached him. Northwestern, Iowa, Carnegie Tech – most of these were trial balloons being floated by schools officials hoping to get a read on Rockne’s willingness to leave South Bend. As recently as December, a prominent alumnus at Wisconsin made it known to Rockne he could take over as football coach and athletic director; but Rock didn’t pursue the lead, in deference to his great friend, Badger basketball coach Doc Meanwell, himself a candidate for athletic director. But this offer, from a land with so much to offer, this was different. Rockne’s pledge that he would never leave Notre Dame seemed long ago and far away, even after winning a national championship. The Rocknes wrapped up their stay, said goodbye to the palm trees and sweet smells of jasmine, and headed back to snowy South Bend. On January 15, 1925, the Southern Cal comptroller wired Rockne that all of his conditions had been met. But the agreement soon took an awkward course. News of the offer made the Los Angeles papers, and then those across the country, before Rockne was able to meet with Father Walsh and attempt to get out of his long-term Notre Dame contract. Walsh, like many others, found out about the offer from the newspaper reports, and threatened legal action if it proceeded. Southern Cal officials apologized for the leaked story, but reiterated its desire to sign Rockne. In the end, though, Walsh’s bluff worked to scuttle the deal. Rockne feared legal action, and told Southern Cal he regretted the whole incident, since it might have put him in a negative light with some important Notre Dame alumni. A final shot came from one Southern Cal official, who noted that it was “almost criminal” for Notre Dame to hold Rockne to his contract, if it was clear Mrs. Rockne much preferred to live in Los Angeles. In the end, Southern Cal didn’t get its man, but relied instead on a recommendation from Rockne to talk with former Iowa coach Howard Jones, who at the time held a 1-0 career coaching record against Rockne, having led the Hawkeyes to a 10-7 upset over the Irish in 1921 at Iowa City, ending a 20-game Notre Dame winning streak. In eight seasons at Iowa, the former Yale standout had crafted a record of 42–17–1. But a contract dispute escalated after the 1923 season. It seems that Jones’ wife was not fond of Iowa City, so Jones requested a contract that would require him to live in Iowa City only during the football season. The university balked, and Jones resigned as coach and athletic director. For the 1924 season, he coached football at North Carolina’s Trinity College, today’s Duke University. In 1925, he began his superlative 16-year run as USC’s head coach. Check out the Order Information tab on how to get your own copy of the award-winning book. One positive result of the back-and-forth over Rockne’s possible move to the West Coast was an agreement to begin a football series between Notre Dame and Southern Cal, beginning in 1926 with a season-ending game at the Coliseum. The every-other-year trip to Southern Cal to end the season became a jewel on Notre Dame’s schedule, and overshadowed any desire or plan to find a post-season game, which would become known as bowl games. And, indeed, the 1925 Rose Bowl was the last bowl game the Irish would play in for the next 45 years. Instead, the trip west to meet the Trojans to conclude every other season became the premiere event, with major supporters of the Irish joining the train entourage in South Bend and along the way. Knute and Bonnie Rockne would turn the trip into some vacation time, such as in 1926, when they steamed from California to Hawaii. So, in a sense, they enjoyed the best of both worlds – soaking up the sun among the palm trees, while still being employed by the university that had been Rockne’s home since 1910. For Brian Kelly, it will be more like an either/or proposition. Escape to the pros, or stay at Notre Dame and face the many challenges that come with the job.